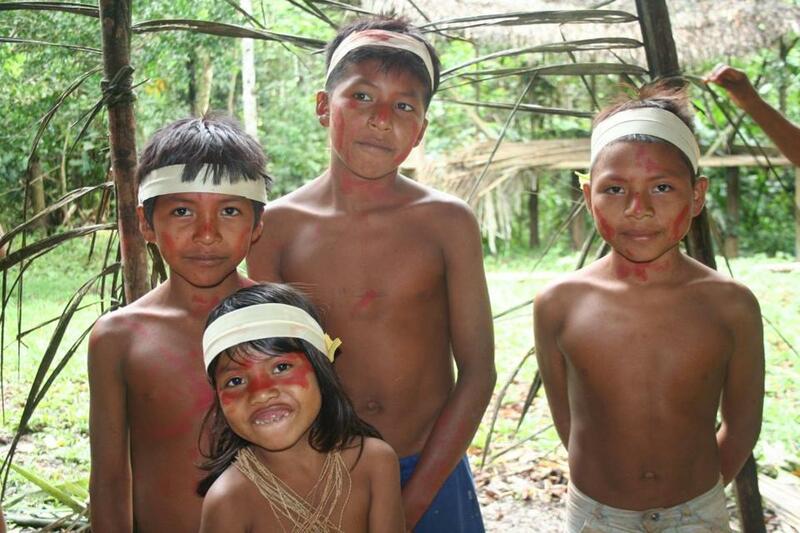 Huaorani children greeted visitors, who are flown into their community in the remote Ecuadorian Amazon. YASUNI NATIONAL PARK, Ecuador — There’s no easy way to visit the Huaorani people in the remote Ecuadorian Amazon. Awakened before sunrise in Quito, we would drive on the Pan American Highway alongside the snowcapped peaks of the Andes, before dipping down in the valley past communities that specialize in one industry, such as stores in Pelileo selling only jeans. We cruised past food stalls overflowing with passionfruit, guanabana, and tree tomatoes; watched the meat of choice, guinea pig, being cooked on the spit; and saw women making fresh tortillas in large clay pots. Three hours later, we reached the quaint town of Baños below the steep green flanks of the volcano Tungurahua. The town has become an outdoor hub for folks who want to visit the numerous waterfalls in the region, go bungee jumping, or simply soak in the hot springs it is named after. A quick pit stop at the bakery, Café Ricooo Pan, to have bread washed down with strong coffee, and we were off again for a 90-minute drive to the town of Shell. As we drove through a series of tunnels, the terrain would shift dramatically from the vertiginous highlands to the lowlands where the leafy ferns, tall palms, and banana plantations of the Amazon thrive. After waiting more than three hours for the rain to subside in Shell, we boarded a plane that snugly fit the pilot and my family of four. We flew over a lush canopy, with long rivers snaking through the carpet of green. There were no signs of civilization during the hourlong flight, as if this landscape was lost in time. Looking left and right, the pilot somehow spotted the grassy runway, and we made our descent, soon skidding to a stop. “Waponi! I’m Emy,” said the man with the almost toothless grin who would be our guide the next four days. As we exited the plane, we were surrounded by a group of clothes-optional villagers who escorted us past a meetinghouse thatched with palm fronds down to a river where a wooden dugout canoe with makeshift benches awaited. As Emy started the motor and it began to rain, I looked over at my kids, who were taking everything in stride. Having just flown from Boston to Quito the day before and then enduring this grueling journey, they could travel anywhere, I thought. Well, maybe not everywhere. The Amazon as seen from the Plane. “Dad! Dad, come quick!” yelled my daughter, Melanie, 15, a short time later as we were unloading our luggage at our respective cabins at the Huaorani Ecolodge. “Get that thing off,” she said, pointing to large green lizard whose tongue seemed to be glued to the window screen. I found a stick and swatted at the lizard. It was pitch dark with no electricity in the cabins (though, thankfully, with a toilet and cold-water shower). We were given flashlights and clumsily made our way to the dining room, where I was surprised to find a German family of five with far younger children who had arrived a day earlier. After a tasty dinner of tilapia with avocado and banana chips, I went back to the cabin to read via headlamp. Listening to the high-pitched cicadas, deep-throated frogs, hoots of owls, and other odd sounds of the jungle, I finally had time to reflect on where we were, deep in the Amazon hosted by an indigenous tribe. Stretching from the eastern flank of the Andes to the borders of Colombia and Peru, Ecuador’s Amazon region, the Oriente, is one of the most biologically diverse areas on earth. Covering almost half the country, it’s home to only 5 percent of the population. Today, the habitats and traditions of the Oriente’s remote communities are under threat from oil companies, palm oil plantations, and loggers. Fortunately, Ecuador is at the forefront of ethno-tourism, with indigenous groups increasingly using ecolodges as an economic alternative to selling their land. One of the prime examples is the Huaorani Ecolodge, this solar-powered oasis in the heart of the 1.7 million acres of Amazon owned by the Huaorani. It wasn’t until the sunlight splintered through the dense foliage the next morning that we understood the allure of the Amazon. Escorted by Emy on a longboat down the murky Rio Shiripuno, we spotted tropical birds from yellow-rumped caciques to the fluffy orange-backed troupial to the magnificent paradise tanager, with its splashes of bright blue, red, and yellow feathers. In the distance, macaws flew overhead and we could make out the white face of a saki monkey sitting on an extended branch. On the edge of Yasuni National Park, the Huaorani Reserve is easily one of the most remote destinations in South America, at least 100 miles from the nearest grocery store. Like his forefathers, Emy is forced to hunt and fish for his sustenance. He docked the boat and we hiked through the forest so he could show us how he uses a 7-foot-long poisonous blowgun. He effortlessly shimmied up a tall palm with his blowgun. We all attempted to climb the same slippery tree and my son, Jake, was one of the few to make it off the ground. We tried holding the blowgun, which was heavy and awkward. It is the same weapon Emy uses to hunt wild boar, monkeys, and toucan. “What does toucan taste like?” I asked. I looked over at my wife who was letting a 5-inch-long centipede climb up her arm. “It tickles,” she said with a chuckle. A blue morph butterfly flew by as we took turns rolling up large leaves and blowing through them to try to emulate the sound of a toucan. The following morning, Emy escorted us via longboat to a village where a bare-breasted grandmother left her hut to show us her farm. Speaking Spanish, she said, “Welcome to our home. We have everything we need. We have yucca, avocado, we have papaya.” She grabbed a papaya, cut it, and handed a piece to each of us. It was by far the juiciest papaya I ever tasted. I realized that to teach the kids about how others live a full life with very little means, I could do no better than a visit with the Huaorani. We camped that night in platform tents downriver, waking the next morning to trek and swim in a waterfall hidden on the hillside. On our final boat ride, we spotted a baby caiman sliding into the water, viewed turtles sunbathing on an overturned log, and followed kingfishers down the bends of the river. We disembarked at the first road we’d seen in days, hugged Emy goodbye, and transferred to a van to make our way to the airport in Coca for the flight back to Quito. Long pipelines and the Petroecuador trucks we shared the road with showed how perilously close the Huaorani are to big oil. There is no telling how much longer this authentic travel experience will last. The Huaorani sit atop one of the largest petroleum reserves in the world. For the past seven decades oil companies have tried to remove them from their land, but the Ecuadorian government has always intervened. 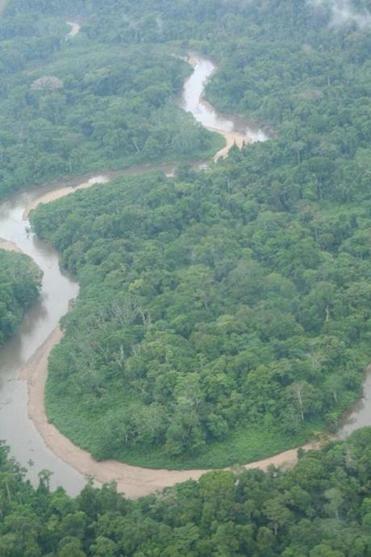 In October, however, Parliament approved a plan to authorize more drilling in the Amazon. Hopefully the oil companies will remain on the outskirts of the park so that future generations of the Huaorani can live off the grid in one of Ecuador’s last swaths of pure wilderness. HUAORANI ECOLODGE Quehueriono, Ecuador. The four-day, three-night package starts at $730 per person, including all meals, lodging, and guides. Transfer to and from Quito is an additional $360 per person.Organized by Tropic Journeys in Nature, 888-207-8615, www.destinationecuador.com/huaorani-ecolodge-ecuador.html.